Potato chips make a great ingredient to use in cooking. It especially works nicely as a crust or coating on meats like chicken, pork, even fish. In this case, I used crushed potato chips to coat a few pork chops. The pork chops were seasoned, dipped in egg and buttermilk then dredged in the crushed potato chips before baking. The result was delicious and didn't make me feel guilty enjoying chips! Combine the onion powder, garlic powder, salt and pepper in a small bowl. Liberally season both sides of each pork chop with the seasoning mixture. Dredge the seasoned pork chops in the flour. Whisk the egg into the buttermilk into a medium sized bowl. Dip the flour coated pork chops in the buttermilk and egg mixture. Place the finely crushed potato chips into a shallow pan and dredge the pork chops to coat completely. Place the coated pork chops on a greased baking sheet and bake in the preheated oven for 25-30 minutes, flipping halfway through. 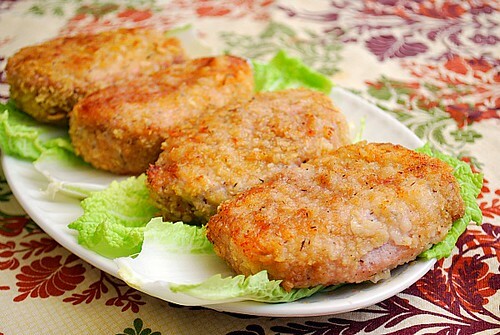 These pork chops look perfect! I like how they were drenched in buttermilk & egg mixture. Mmmm, gorgeous! This looks lush! Can't wait to try it. Thanks for sharing. We don't have those chips flavors, are they new ones coming out? @Medifast Side Effects - stay tuned! New flavors are being rolled out across the country by Frito Lay, with a special event happening on Monday! I'll be posting a special giveaway then so folks can get their hands on some new flavored chips! couldd you use whole milk?